Finally...the day I've been anxiously awaiting since last fall has arrived. Today we stepped the mast. Obviously, this is a big day since it moves us that much closer to actually sailing our "good old boat". But despite my excitement, I was also very anxious because of the unknown. I've never stepped a mast or rigged any sailboat larger than a Laser. Luckily, I received a lot of great advice from forums members at Sailnet and a few other trusted Helms owners. Based on this advice, I constructed a gin pole from Home Depot materials (10' 2"x6", 4 eye bolts, ratchet strap) that made the job very manageable. I cut the gin pole to fit around the base of the mast and used the ratched strap to hold it in place. 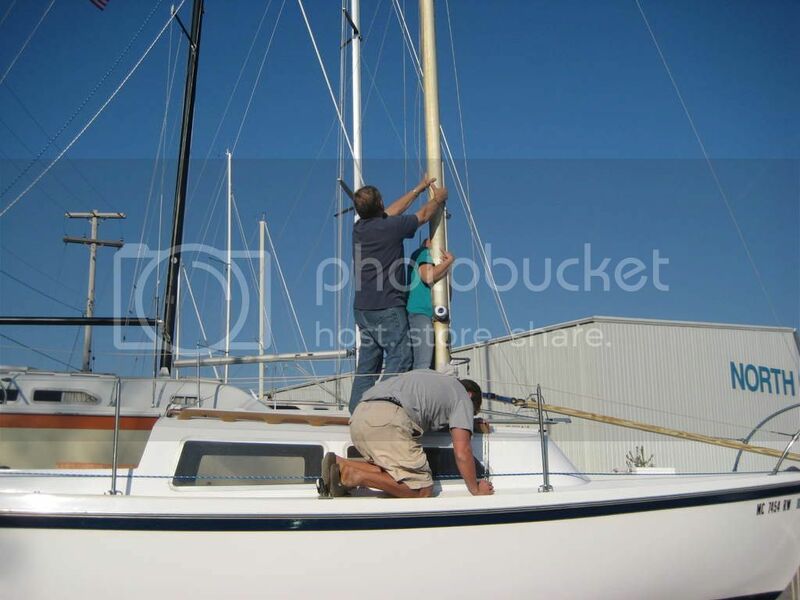 We then attached the forestay to the opposite end of the gin pole and ran a line from the same end through a block on the bow and back to the sheet winch in the cockpit. One person stood holding an extension ladder which supported one end of the mast. Another person operated the winch. Yet another stayed at the mast hinge to keep the mast from tipping to either side. The fourth person moved frantically about the deck attaching stays and shrouds to chainplates. It was a beautifully orchestrated dance, in hindsight, of course. I was fortunate enough to enlist the help of my wife, mom, dad and two little girls. 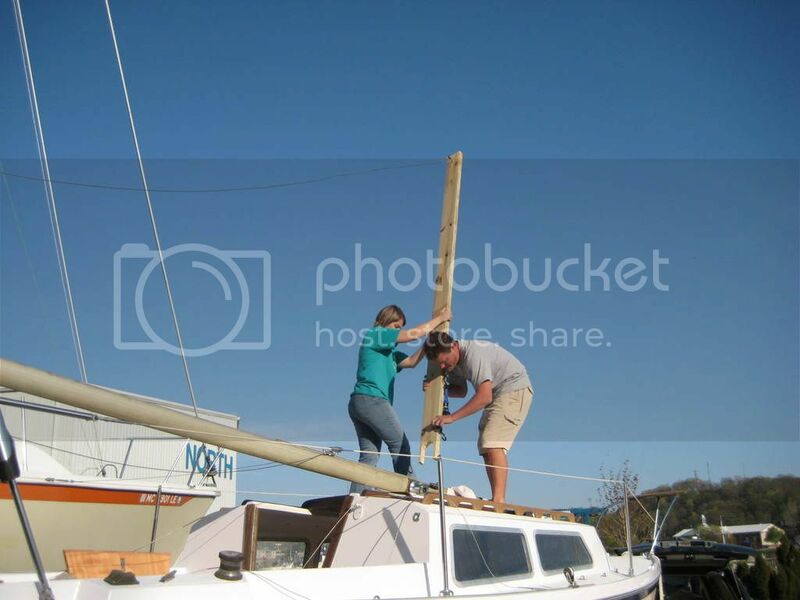 Six novice "steppers" working together to get the mast up before sunset. I'm happy and proud to report that we did it without incident! 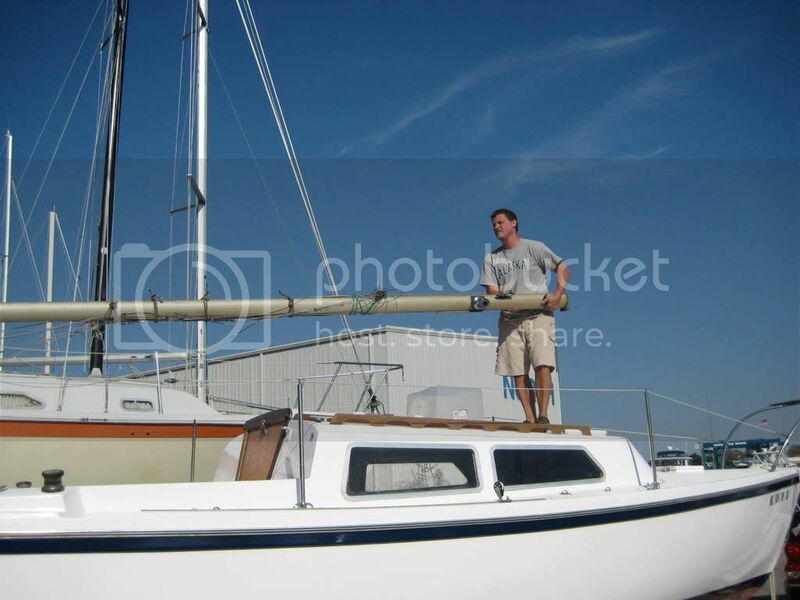 Yes, we had some tense moments when I thought the halyards had come off the sheaves after the stick was up and when the weight of a heavily leaning mast lay on my shoulder when we forgot to cleat off the tailing end of the line from the sheet winch. But I can't express the shear joy of seeing our little boat with an upright mast waiting just feet from the water for her day to be splashed!